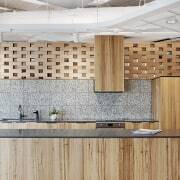 Built in a porous brickwork pattern but made from wood, the reception desk and screen in ADCO Constructions’ new office fit-out by architects Woods Bagot signals a transparent construction firm that thinks outside the square. The reception area is the perfect opportunity to create a physical or graphic reflection of a firm’s ethos – one that greets clients, colleagues and friends alike on their arrival. 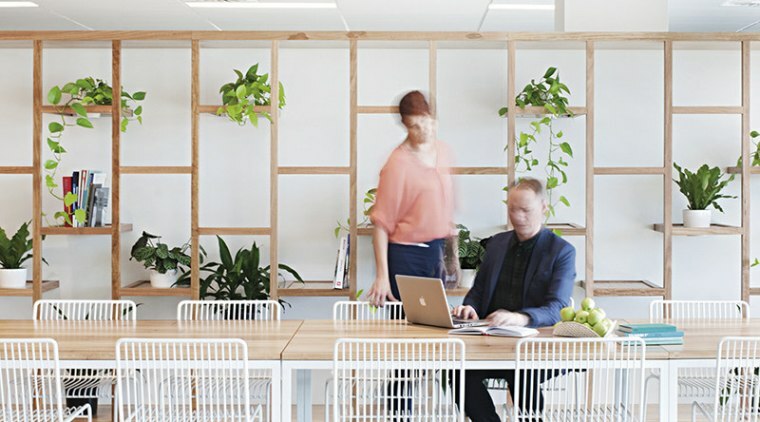 This was certainly the case for family construction company ADCO, when Woods Bagot fitted out the company’s new office. 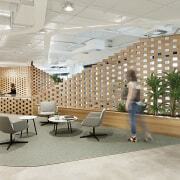 Woods Bagot designer Brittany Pearce says the ADCO reception is at the heart of the space and is the first thing you see when stepping out of the lift. 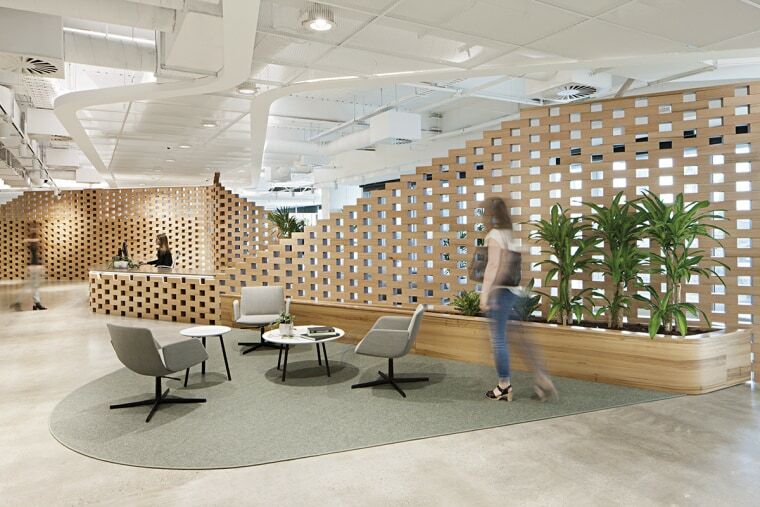 “The individualistic reception desk and privacy screen behind are both finished in the same unusual treatment,” says Pearce. 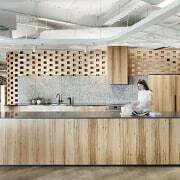 Besides evoking the company’s woodworking dexterity, the feature wall also performs other functions, both in terms of providing a statement of company intent and regarding space allocation. And it’s this sense of transparency that informs much of the light, contemporary fit-out. 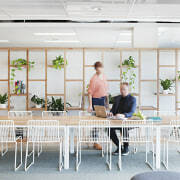 Beyond the central reception wall at ADCO Constructions’ new offices, there are built forms enclosing meeting rooms, a conference room, a projector room and a quiet space. To the left and right of the wall are two built zones with meeting rooms, a large boardroom, a projector room and a quiet room. The workspaces are beyond these, by the windows at the outer edges of the office. The cafe – used by visitors and staff – is directly behind the wall. 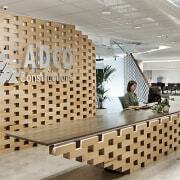 This is designed in similar finishes to the reception, again calling to mind the nature of ADCO’s business. 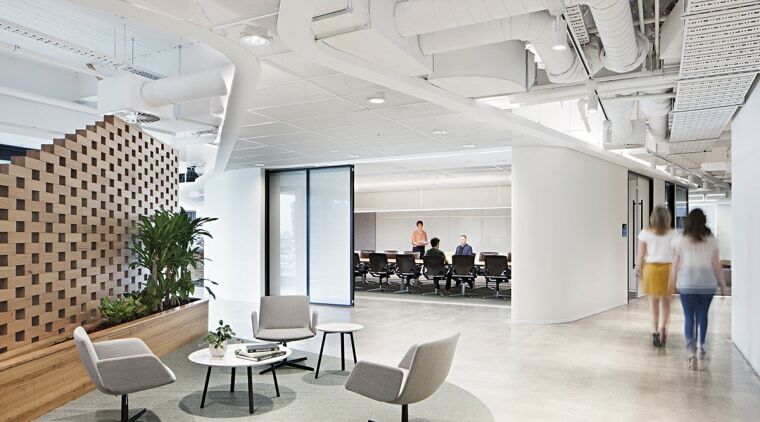 In aesthetic terms, the construction company’s office space is light and airy, with polished concrete floors, rugs to denote spaces like the reception waiting area, plenty of plants, and most surfaces painted white. The services were exposed and also painted white in another nod to transparency. Another feature is the introduction of a curved drop ceilings to delineate areas of use in the fit-out. Even the choice of casual furniture adds the light, almost domestic feel of the space, Pearce says. 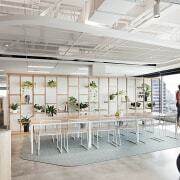 The cafe in the ADCO Constructions fit-out by Woods Bagot features lightweight outdoor furniture – adding to the fit-out’s ‘light-on-its-feet’ feel. “We chose outdoor furniture for the cafe space to further the sense that clients and visitors are dealing with an adaptable, flexible team. Everything about the fit-out says transparency and versatility. Feature suspended ceiling to reception space, MetalWorks Mesh Rhombic 4 in White. Exposed and painted ceilings to open collaboration and breakout space.